Gardencraft has over 25 years experience in timber building manufacture and by using the latest machinery and production facilities guarantees a first-class, consistent product at the lowest possible cost. We use heavyweight framing timber, diagonally braced at all corners, combined with thick cladding to give a completely rigid, long-life structure. The Gardencraft range of purpose-built kennels will satisfy the most demanding requirements of the professional breeder, security firms or the enthusiastic dog lover. These tried and tested units give the correct blend of draught-free, ventilated accommodation that all dogs need. We are proud to have been selected to supply Police Forces, HM Customs, RSPCA and animal rescue organisations as well as a number of security firms. 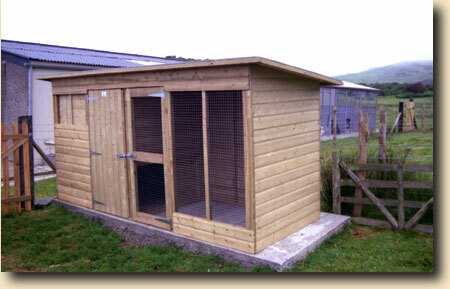 All kennels are strongly built to the highest specification using selected Swedish timber. Roofs are made of exterior plywood finished with heavyweight green mineral felt. All timber is treated by the TANALITH E © pressure system to give a 20 year life with no further attention. All metal components are galvanised for long life with minimum maintenance. We have a standard range of kennels but we are always pleased to quote for your individual requirements or multiple units.